In recent history, the “flute choir” has been a much-maligned ensemble, despite a rich history that dates back to the Renaissance. Different Stones: Canadian Music for Multiple Flutes is an exposé of music by Canada’s younger generation of composers, and a testament to the timbral diversity and expressive capacity of this often-neglected genre. The music of this CD boasts a wide range of styles and aesthetics: from the works of Nobles and Kovarik, which openly embrace traditional forms and harmony, to the more abstract and austere compositions by Butler, Rabe and Maxwell. Each piece is written for ten flutes, with many of these works utilizing piccolo, alto flute and bass flute, thus extending the range and timbre of the ensemble. For this recording, all ten parts have been multi-track recorded by flutist Mark Takeshi McGregor. Banff, Alberta, November 22, 23, 24 novembre, 2008. This CD was made possible by generous funding from the Canada Council for the Arts. 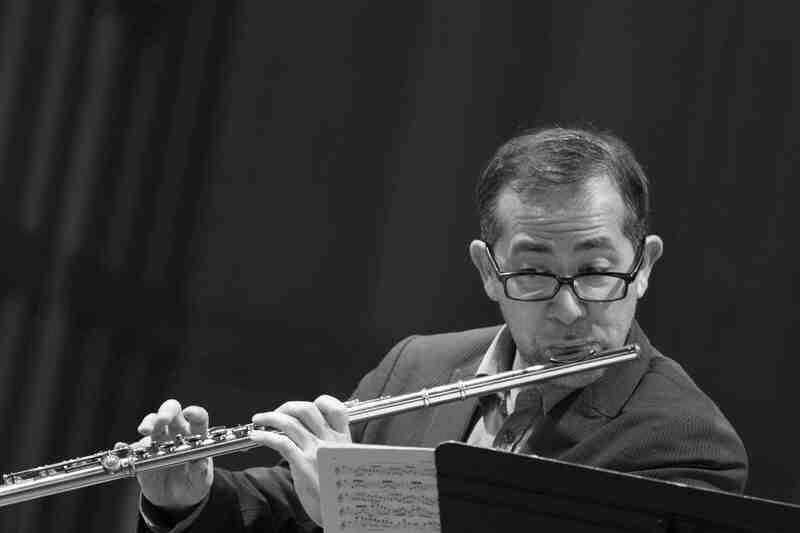 Described by the press as a musician of “huge physical energy,” Mark Takeshi McGregor is flutist of the Aventa Ensemble and an outspoken advocate of new music. He has given the premiere performances of Anna Höstman’s flute concerto Trace the Gold Sun with the Victoria Symphony, Turmalin for solo flute by the Danish composer Anders Nordentoft, and has commissioned new works by composers as diverse as Michael Finnissy, Nicole Lizée, Paul Steenhuisen, and Michael Oesterle. He has performed across North America, Europe, Australia, New Zealand, and Israel, including appearances at Festival Montréal-Nouvelles Musique, Music Gallery (Toronto), Vancouver New Music Festival, New Works Calgary, Athelas New Music Festival (Copenhagen), and the Internationale A•DEvantgarde-Festival (Munich). McGregor’s discography includes Delicate Fires (2007) and Trade Winds (2013) with Tiresias Duo, his decade-long collaboration with pianist Rachel Kiyo Iwaasa; Different Stones: Canadian Music for Multiple Flutes (2009), featuring works for ten flutes by Canadian composers; and Sins & Fantasies (2013), a showcase of new works by Dorothy Chang, Gregory Lee Newsome, Owen Underhill, Jocelyn Morlock, James Beckwith Maxwell, and Benton Roark, each inspired by one of the Seven Deadly Sins. Sins & Fantasies was nominated for Classical Recording of the Year at the 2015 Western Canadian Music Awards.